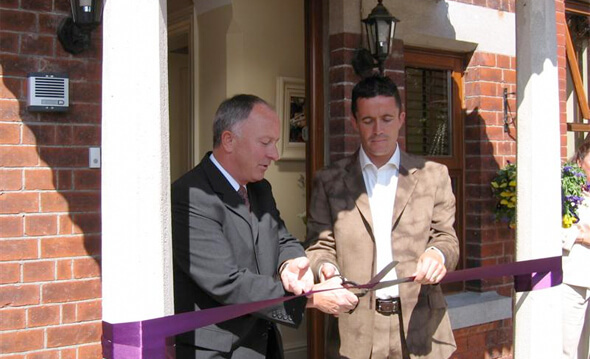 The Gary Kelly Cancer Support Centre is situated in Georges Street, Drogheda, Co. Louth. It is a place of reflection, retreat and recovery for people 18 years and over living with a cancer diagnosis and their family members. Gary Kelly, was a professional footballer at Leeds United FC and member of the International Irish Squad. He donated three quarters of a million euro (proceeds of Gary’s Testimonial match held 7th May 2002 at Leeds) to a cancer-related project in Drogheda. Many of the local businesses matched Gary’s generosity by donating time, material and labour to the project. Mandy Weldon, sister of Gary Kelly, died in 1998 through Breast Cancer and the memory of Mandy afforded Gary the opportunity to give something back to the region as a result of his successful career. A voluntary Board of Trustees was established in 2002 and a Deed of Trust was formed for the registered charity. Premises were sourced in 2003 and renovation work began. All other costs had to be raised through donations, fundraising and sponsorship. The interior design of the centre is of a holistic and organic nature which creates a warm and tranquil atmosphere. The centre was officially launched on 16th June 2004 by Gary and the then Minister for Communications, Marine and Natural Resources Mr. Dermot Ahern.